Dusk comes early here on the mountaintop--or what passes for a mountaintop in New Jersey. Our home sits on top of the first ridge of the Watchung mountains; it is not even worthy of a name; it is simply the first ridge. We are surrounded by trees, and as the sun dips below the the uppermost branches, our light dims--nearly an hour before it does elsewhere in town. 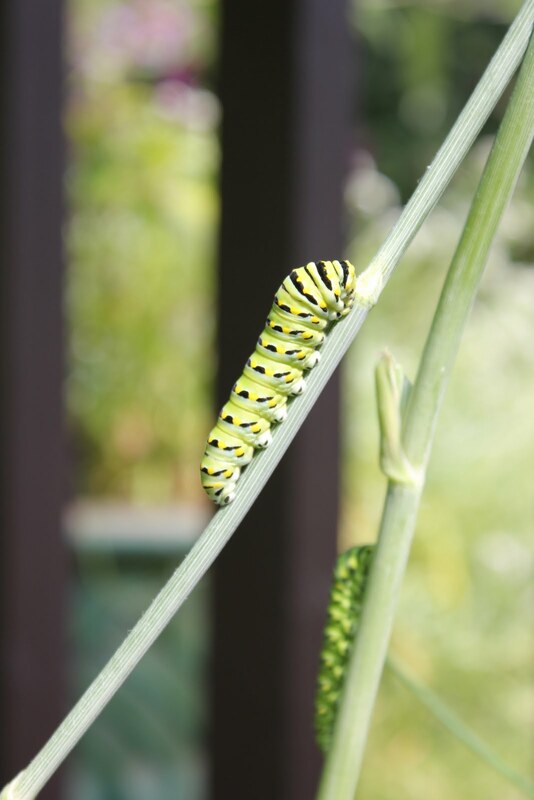 As it gets dark, our daytime visitors--birds, bees and butterflies--are replaced with creatures of the night. They are no less beautiful, and no less fascinating. And every night, I get to see who has stopped by for a snack. Before I head to bed, I offer One Last Potty to the pups; it's our last outside visit of the day. Jasper and Tucker usually come running to the back door, but Lilah waits to see if I Really Mean It. She's right, because sometimes I get distracted before we head outside; a load of laundry needs to folded or some dishes left in the sink cry out to be washed. Once Herself joins us, each dog gets to Ring the Bell (they're learning to ring a bell as a sign that someone needs To Go). Then I attach a small color-coded light to his or her collar; it's the only way I can see where they are at night, particularly Stealth Lilah, whose black fur causes her to disappear when she's more than a yard away from me. I then leash everyone, all dogs Sit, then Look at Me and await the magic word, "Release," which allows them to go through the door. Everyone must walk nicely on their leashes as we cross the deck to the patio, where they must sit calmly again, allow me to take their leashes off, Look at Me once more, and then "Release" sets them free to run through the night and do their business. I always carry a flashlight with me during Final Potty Time, so I can bag up and remove their "business," but it also gives me an opportunity to see who has come to visit after dark. The moths come out first; as soon as the sun goes behind the trees, the butterflies disappear and are replaced by their nocturnal cousins. They feed on the same flowers, and flit around my butterfly bushes, supping nectar and unaware that they are not “moth” bushes. Until I actually started searching them out, I had this generic visual picture of a moth as a dun-colored nonbutterfly that maniacally attacks light sources. Let me be clear; I was Very Wrong. These creatures are really quite gorgeous. That said, identifying moths is much, much harder than identifying butterflies. For one thing, there are just so darn many of them: more than 10,500 species in North America alone by one estimate, compared to 750 butterfly species. 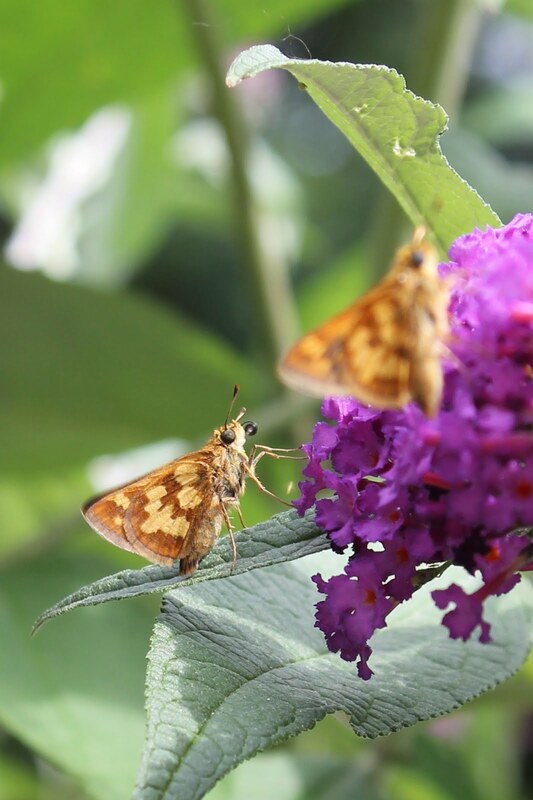 I believe this is a Spotted Straw Moth, feeding on my buddleia, or butterfly bush. I haven't a clue who this gorgeous creature is. The wings were tiger striped, orange and black. I only saw him once. This moth was about 2 inches wingtip to wingtip. But, again, I couldn't identify him. Amazingly, there are a zillion butterfly identification books, but little or none for moths. And the online resources are not geared toward rank amateurs like me. In addition to the the butterfly bushes, I also find moths on my front porch, where they congregate if we leave the lights on. This happens only when we're expecting visitors, as I'm a firm believer in dark skies. Hanging out above my front door was this moth; I love his mottled wings. You can imagine if he was on the trunk of a tree, he disappear. Such perfect camouflage. Sometimes, when I'm out in the yard, I see bats swooping and diving through the air. I LOVE bats. They eat mosquitoes, as well as other tiny insects. Did I say I love bats? And every once in a while, I'll hear--but rarely see--an owl. Usually, it's a great horned owl; I can recognize the call. And what's so neat about the great horned is that if you do a half-decent imitation of their call, they'll answer you. Many an evening will find me out in the backyard hooting at owls. Hey, the neighbors are far enough away; they probably think it's just a owl with a funny voice. I've also heard screech owls; these birds make those sounds you always hear in scary movies when a half-dressed teenaged girl is lost in the woods. It's very eerie, but way cool. After about 10 or 15 minutes outside, the dogs have sniffed the important sniffs and barked at any deer in the vicinity. Who ignore them, having learned that not only does a deer fence keep deer out of my yard, but also keep dogs in my yard. Most nights, if there are deer, they might stand up if they were laying down, but usually they just stare at the dogs, with only a slight ear flick indicating that they even hear the ruckus of the hounds. And they don't move. Which of course, drives the dogs nuts. I'm sure the deer are amused. Another creature not stopped by the deer fence is the raccoon. While I've not met one personally--nor have the dogs--I often see the telltale footprints, as well as the creative destruction, that are their calling cards. I have to put a heavy rock on the bird seed can, or they'll open it up and snarf down the sunflower seeds. And every night I have to remove one particular bird feeder that the raccoons have learned to knock off its branch so that it crashes to the ground and breaks open: an easy feast. So every night, I carry that feeder into the garage, where I put it in a large plastic tub, so the mice don't get it. That worked swell until one night a scrabbling noise stopped me just as I was about to drop the heavy feeder into the tub. Flashlight in hand, I looked into the tub to discover that a friendly neighborhood mouse had stopped by. Well hello there Mr. Mouse. You're cute, but you're cuter when you're in the woods instead of my garage. And with Dawn and Athena around, your life expectancy is much greater outside my house versus inside. He must have jumped in and couldn't jump out. I brought the tub to the side of my driveway, and let Mr. Mouse scurry away beneath the forsythia. It should be noted that the next night, Mrs. Mouse tried the same trick, followed one day later by Uncle Mouse. Hopefully, that was the last of them. 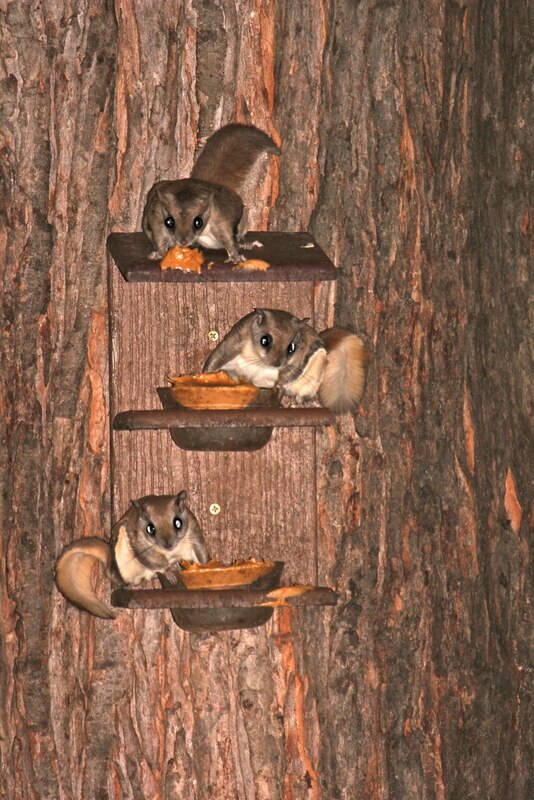 For those of you unfamiliar with these creatures, it turns out that New Jersey is home to Southern Flying Squirrels, who feed on mushrooms, fruits, berries, insects, and, apparently, peanut butter. A family of at least five squirrels live nearby and they know when I bring the peanut butter out, and usually make an appearance within five minutes after I've slathered Skippy into what has become the Squirrel Feeder. 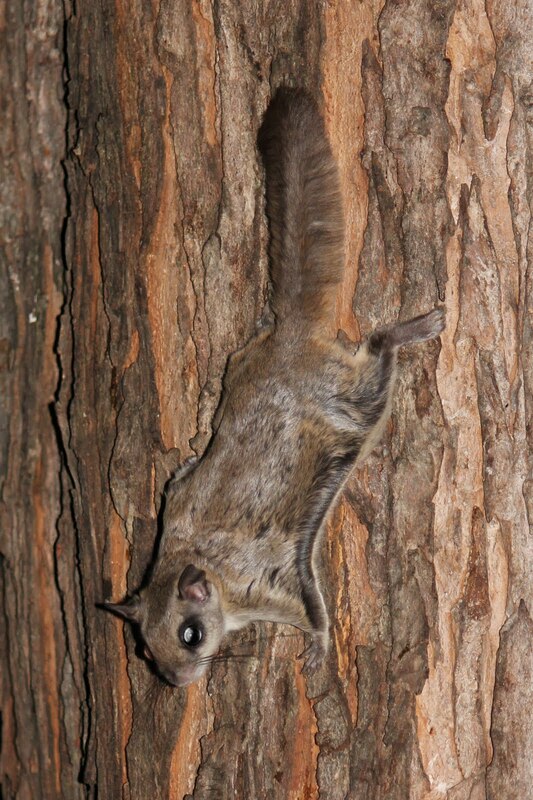 Flying squirrels don't really fly; they glide using flaps of skin between their front and rear legs. Imagine a furry washcloth with paws at each corner and a head and tail centered on either end. 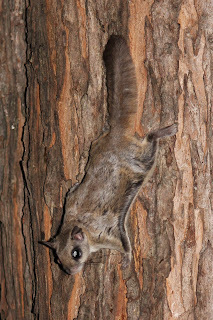 Here you can see the skin flap as one of them scurries down our maple tree. Checking out the peanut butter. 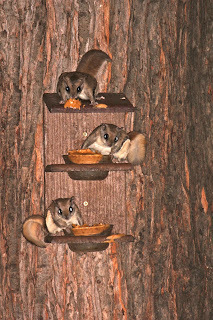 Flying squirrel buffet: three squirrels settle down for their evening meal. By now it's time to bring the dogs inside, as they Really Want To Get the Squirrels, and I really Don't want them to get the squirrels. 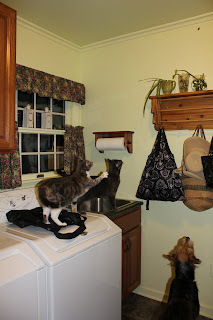 In the mean time, Dawn and Athena have set up a moth patrol in the laundry room, having learned that sometimes, if they are Very Lucky, a Gift will fly into the house as three dogs tromp in. And oh! What happy times when the cats get to chase a moth. Moths do get in every so often, and when it happens, the cats are mesmerized. And so is Tucker. He wants to Get the Moth, too. If you look carefully, at the top right of the picture is a tiny dark speck. No, your computer screen isn't dirty; that's The Moth. This guy wound up in our laundry room recently. He had a 3-inch wingspan. I'm pretty sure he was a Common Gray moth, but I thought he was anything but common. Even though the cats Wanted to Get the Moth really bad, we rescued him and set him free back outside. Usually, we try to Live and Let Live, and help the moth back outside to enjoy the rest of its short life. The cats aren't disappointed for long, as part of the nighttime routine is a small bowl of crunchy kitteh noms, which more than make up for the loss of the moth. And while we non-nocturnal creatures head to bed, the nightlife of the residents on the first ridge of the Watchung Mountains has only just begun. The human-dog bond is universal. This is my dad, about 80 years ago, with his best friend Ruby, an Airedale. Tucker sleeps all night in a crate at the foot of our bed. When I open the crate door in the morning, it would seem obvious that he would come charging out, ready to face the day. Yet he lingers, stretches, and falls back to sleep, quite content to stay in the crate, even though Jasper and Lilah are standing in front, wagging their doggy butts off, so they can give him a morning greeting. And often, during the day, Tucker will climb into his crate in the dining room, curl up and go to sleep. Yet when he first came to live with us, it was a completely different story; when I invited him to sleep in the crate, closed it and left the house, he went nuts and dug like crazy to get out. Every day when I walk the dogs, I work with both Jasper and Tucker to be calm when they see another dog. We've made progress, but apparently Jasper remembers every house where he's encountered another pup, and begins to whine as we walk by--even if there's no dog there at the moment. On a walk the other day, Jasper saw Two Rabbits in a yard. He was not allowed to chase those bunnies, but he Really Really Wanted to. I gave him the Leave It command, along with lots of treats, but he still wanted to go after those long-eared varmints. Of course I didn't let him. On our next walk two days later, he whined as we walked past The Bunny Yard. There are no dogs in that yard. And we only saw rabbits that one time. On a recent weekend, we went to dinner in the city for a birthday celebration. My son Aaron brought home a couple of helium balloons. Lilah took one look at these strange items that floated and backed away, looking very concerned. I brought a balloon down to dog nose level, and encouraged her to Touch It With Your Nose, which she did, accompanied by a long slow wary wag. She got treats for Being Brave. But later, as she walked down the hallway past the balloons, she gave them a wide berth. What were they thinking? What is going on in those doggy brains? I can't tell you how many times I've wondered that. 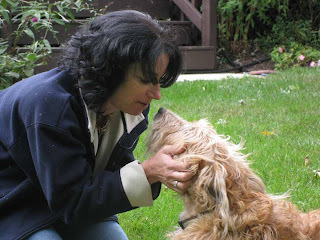 In search of a few answers, I found Dog Sense, a book by John Bradshaw, that gave me an entirely new perspective on the wonderful creatures with whom I share my home and life. Bradshaw summarizes tons of in-depth research about canis familiaris in a way that even the non-scientist can appreciate. 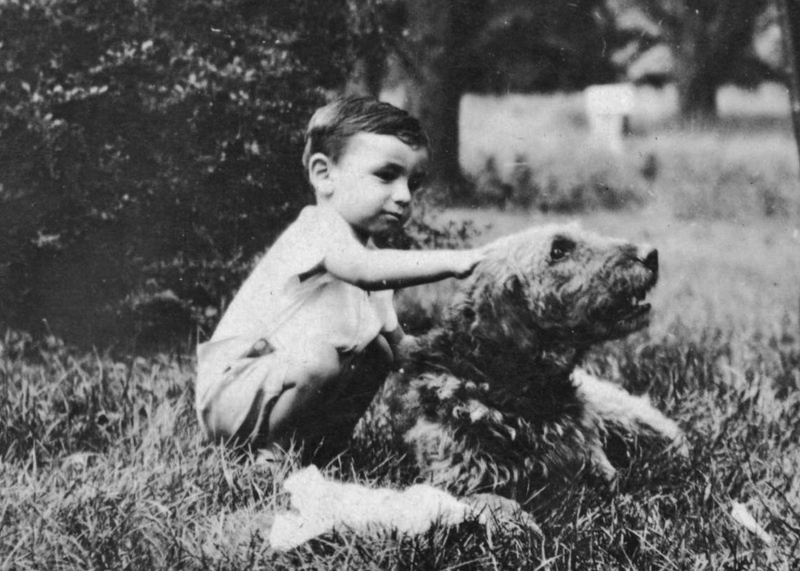 He explores the evolution of our beloved pets, and writes about dozens of studies that give us non-canines a few glimpses into the minds of these fascinating animals. It turns out that the thinking about domestic dogs in terms of a pack structure was based on faulty research into the way American wolves behave in captivity or stressed circumstances. Our current dogs probably didn’t evolve from these wolves, but instead from early ancestors of the Timber Wolf in Europe. In studying these animals, who are more closely aligned to the domestic dog, researchers have found that the groups they form aren't really all about the alpha male and alpha female. Most groups are formed around a central pair: the parents of the rest of the animals in the group. Thus, those of us who refer to ourselves as our pets’ Mom or Dad are probably a little more on target than calling ourselves pack leaders. I’ve always thought I was Lilah, Jasper and Tucker’s mommy (and Kelsey, Pasha and Rosie’s mom, too); now I’ve given myself permission to say so in public. Dogs have a very different sense of time. Very. Different. Think about it; if you have dogs, you know this already. 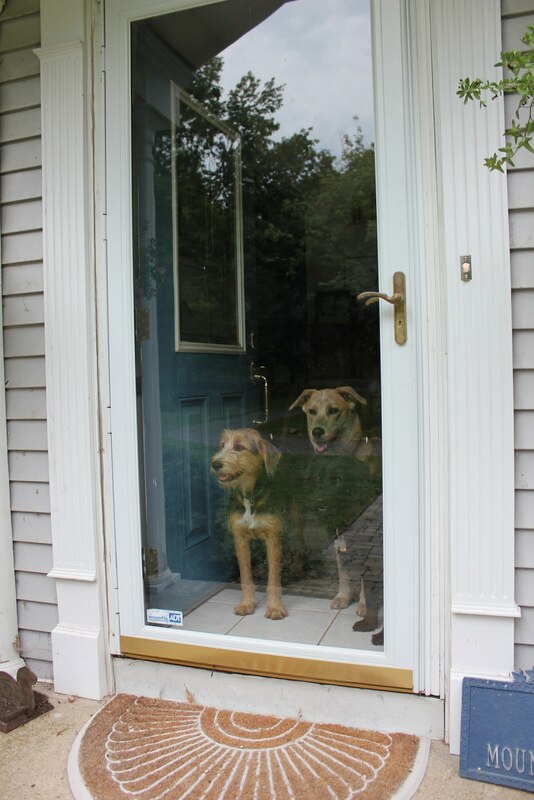 When I leave the house, and then realize I forgot something (please don’t ask my family how often that happens), I'll come back inside seconds after I left and the dogs will greet me like I’ve been gone for days. Perhaps weeks. That’s one of the reasons so many dogs have separation anxiety; they don’t know that you’ll ever, ever come back. This was Tucker's issue; at first, when we left him home in his crate, he was so anxious that he’d dig up his blankets and make a terrible stinky mess (I’ll spare you the details.) We’ve been practicing leaving and coming right back and giving him treats—and he’s gotten much, much better: no more messes. He can stay in his crate comfortably for a good 3 hours while we're gone. Tucker, quite comfortable, in his crate. Jasper, who isn't crated while I'm gone (because he doesn't chew everything in sight like his brother), still misses his Mommy (that’s me), and pines while I'm away, but doesn't act out. He has a special Waiting for Mommy spot where he lays, sighing every now and again. According to Bradshaw, studies show that even if dogs are left with other dogs for company, they still experience separation anxiety when their humans have left then alone. The strength of the human-dog bond can be more intense than that between dogs. Jasper in his Waiting for Mommy Spot by the back door. Bradshaw believes that dogs and people have co-evolved, and one of the results is that dogs are uniquely tuned in to humans. They are the only species whose members routinely look into our eyes. They understand when we point to something to look away toward it, or to look at what we are looking at. They learn our vocabulary. If you have dogs, you will sometimes think they can read your mind. Lilah looks like she's about to say something profound. I'm sure she'd have so much to say, if I could only understand her. Most often, it is because dogs watch everything, and are alert to all kinds of nonverbal cues that tell them what is going on—not just your activities (I’m picking up a leash so it must be time to Go For a Walk), but also the smells and subtle changes and movements that speak loudly to dogs. If I do anything out of the ordinary, the dogs will notice--and react. Just the other day, I started a new exercise routine that required me to lie on my back on the floor and lift some weights. All three dogs came running to investigate this unusual behavior. I thought the dogs were going to lick me down to the bone. “Mommy isn’t acting right! She’s on the floor! She’s doing something funny with her arms.” Tucker laid down right on top of me. “There will be no more of that!” So much for my goal of Michelle Obama arms. Tucker keeps an eye out for unusual activities. We’ve only begun to understand these awesome creatures. We really don’t know how they think or exactly how they feel. But after reading Bradshaw’s book, I feel honored—and I use that word on purpose—that these animals have chosen to share their lives with us. 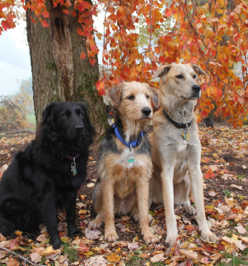 All of my dogs—and those that came before them—have given me a gift by allowing me to get to know them and love them. I look at them differently now, wishing I could tell them in their language how I feel. I guess some belly rubs, a good game of Ball, a Nice Long Walk and a Cookie or two will be the best I can do for now. Jasper, Tucker and Lilah on duty; Mommy has left the building. The book is called Dog Sense. The author, John Bradshaw, appeared on The Colbert Report and was interviewed by NPR’s Terry Gross on her show Fresh Air. He was also mentioned in a great story by Adam Gopnik in The New Yorker magazine, where Gopnik writes about a Havanese that joined a non-dog-loving family and made true believers out of them.